After we left Petrified Forest National Park, we got back on the road to our next destination. We were staying in Williams, Arizona that night but we stopped for dinner in Flagstaff along the way. We didn’t get much of a glimpse of Flagstaff, but what we did see made us both want to visit again sometime in the future. Our choice for dinner that evening was the Beaver Street Brewery (in keeping with Jon’s brewery cravings for the trip). When we got out of the car, we were immediately frozen to the core by the frigid wind! I was surprised by the huge drop in temperature from earlier in the day, only a few hours away. We hurried into the restaurant, and were met with a lively atmosphere, but we were seated right away. 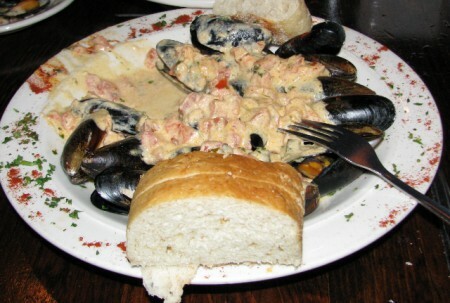 We started with an appetizer of Steamed Mussels in Thai Curry Sauce, served with slices of baguette. It was a fantastic dish! The mussels were juicy and the curry sauce was delicious, with just the right amount of spice. It was a very pleasant surprise, because I’m not usually a big fan of curry spice. Another thing that I liked was that the sauce was thick enough that you felt that you could really get a portion onto the pieces of bread that came along with dish. Steamed Mussels in Thai Curry Sauce – YUM! For dinner, I ordered the Enchanted Forest pizza. It had brie, artichokes, olive pesto, red peppers and pine nuts. It seemed like an odd combination of ingredients, but I decided to give it a try. It was fantastic! It was certainly one of the most creative pizzas I have ever had. There were so many flavors coming together, but it really worked! I let Jon have a little bit, but I have to admit, I pretty much stuffed myself on this pizza. I paired it with a raspberry ale, called the Bramble Berry Brew, which was delicious and light bodied. 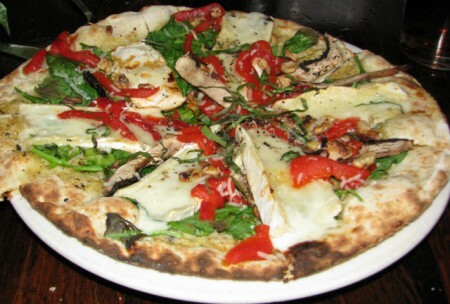 My Enchanted Forest pizza – so creative! Jon had the Green Goddess Salmon salad. It was a big piece of grilled salmon on a bed of mixed greens, zucchini, cherry tomatoes, and a chiffonade of fresh basil. It was drizzled with a balsamic vinaigrette. The salad was so huge that it was heaped on the plate, almost falling off the sides. Jon really liked his meal too, so we were three for three on great dishes! Jon had two beers; the Lumberyard IPA and the R&R Oatmeal Stout. He liked both, but liked the IPA better. He said they were some of his favorite beers from the whole trip. 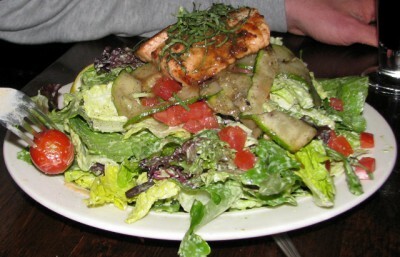 Jon’s Green Goddess Salmon Salad – it was huge! If we lived in the area, I’m sure this would be a place we would come back to. After dinner, we got back on the road for the last 30 minutes of driving to Williams, AZ. Williams is located about 50 minutes directly south of the Grand Canyon, with an easy straight drive up to the park. It also has several reasonably priced hotels. We could have stayed somewhere closer, but the prices go up and the availability goes down as you get closer to the park. Our plan was to stay there for 2 nights, and spend the entire day in between at the Grand Canyon! We watched carefully for elk, because we were driving at dusk, but we didn’t have any problems (we did see an elk right by the side of the road though!). We got the car unloaded in record time because it was still so cold and windy, and checked into the Quality Inn. Luckily, it didn’t take long to get settled into our cozy room and warmed up. Of course, we made it an early night, because we wanted to get an early start on the Grand Canyon! I couldn’t believe we were finally going to see it! Have you been to Flagstaff, Arizona or the Beaver Street Brewery? What did you think? Just Give Me the Wine! Jon and I went wine tasting today after I finished up at a conference. As we bellied up to the bar and began our tasting, we noticed that something was going on. The next couple down from us held some strange fascination for the tasting room staff. They kept asking to take photos with them, and this gigantic, sparkly ring. I thought they must be newlywed friends of the tasting room employees. But more interesting, they were drinking wine out of champagne flutes. So, of course… I asked what they were drinking! Who cares about the people, I wanna know what wine they have! As it turns out, the wine was a Pinot Grigio sparkling wine, and our server gave me a pour of it, even though it wasn’t on the tasting list. It was delicious! I was sold! I don’t think I’ve ever had a sparkling wine made from Pinot Grigio, and this one was great; a dry sparkler with a hint of sweetness. We finished up our tasting and purchased our wine (including the sparkler). As we got into the car, Jon told me that the guy was a Seattle Seahawks football player; and the ring that was being passed around among the staff was his Superbowl ring. Eh… whatever… I’m just glad it got me a taste of that fabulous wine! I have priorities… And don’t ask me which player it was; but Jon didn’t know either. Jon’s birthday gift to me arrived earlier this week… I am so bummed that I haven’t been able to play it because Jon has been working graveyard shifts for the last few weeks! Isn’t it awesome?! I can’t wait! Can you guess which parks are Board Walk and Park Place? 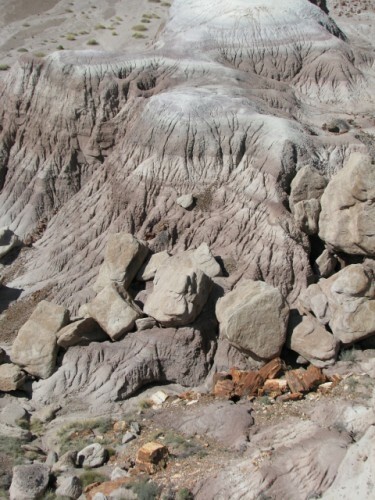 In my last post, I shared our visit to the Painted Desert section of Petrified Forest National Park. Then we traveled further south on the road through the park and visited the areas where there is more petrified wood. As I mentioned in my previous post, this area was part of a sub-tropical river system during the Late Triassic period. Researchers believe the river was about the size of the Amazon or Mississippi Rivers. These soils contain an abundant number of fossils; plants and animals that would have once lived in a river ecosystem. 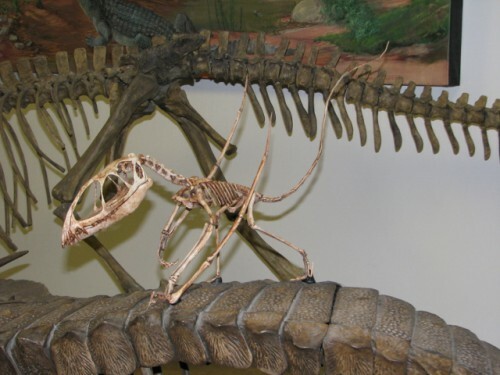 Mollusks, claims, shrimp, insects, amphibians and phytosaurs, which have similarities to modern day crocodiles, are all part of the fossil record here. There are also early dinosaurs. Plant fossils found here include ferns, horsetails, conifers, and several unclassified plants. The petrified logs that we saw on our visit fell and were washed downstream in the river. They were quickly covered over by sediments, and the organic material was replaced by silica that came from volcanic ash. At that point though, there are two ways that a log can become petrified. If the silica fills the tree’s cell walls by forming on the inner surface of the walls until the entire cavity of the cell is filled, and then the process of petrification stopped there, the organic cell walls would remain intact. This usually occurred because there was a lack of water at that point. This is called permineralization, and creates a log that is tan and brown and resembles modern wood. However, if the petrification process continued, and the remaining organic material in the tree degraded and was replaced by more silica crystals, this creates a psuedomorph; a copy of wood. These logs are very colorful, because trace minerals soak into the wood along with the silica. Iron creates mustard yellow, orange, rich red, ochre and black. Blue, purple, brown and black are cause by manganese. 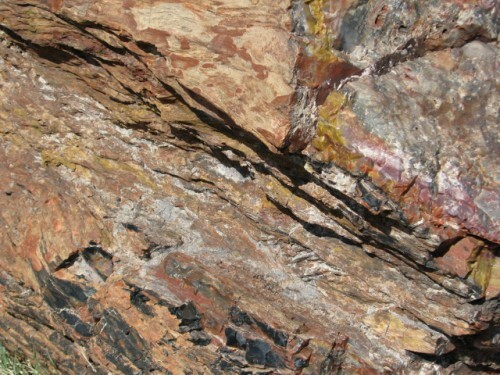 Manganese can also create fern-like patterns in the petrified wood. The detail on these logs is incredible! Some of the logs feature knots where the branches were torn away when the tree traveled downriver. Others have finger-wide holes in the logs; these are caused by damage from prehistoric beetles! A closeup showing the colors in the petrified wood. Jon and I stopped at the Jasper Forest overlook, to see where petrified wood that was once trapped in the earth of the bluff have now tumbled down the hill to the valley below. It is neat to see all the chunks of petrified wood down in the valley. The landscape here makes up part of the Sonsela Member, which dates to about 216 Million years ago. It isn’t as colorful as the Blue Mesa Member, but still very beautiful. Petrified wood below the bluff at the Jasper Forest. This formation is part of the Sonsela Member – at 216 million years old. We also did a short hike on the Giant Logs Trail that is behind the Rainbow Forest Museum. The wood here is quite large, and you can get right up close to the pieces. 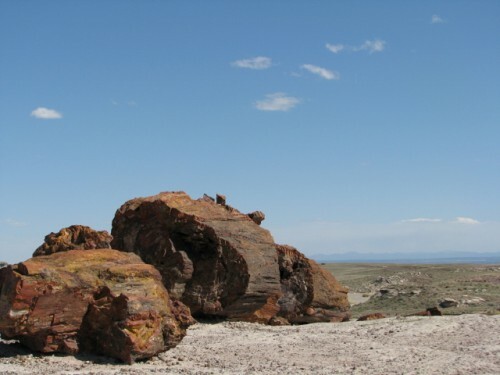 The pieces of wood along the Giant Logs Trail are examples of the more colorful type of petrified wood. I would have loved to spend more time here. There are trails leading to Puebloan ruins and petroglyphs, as well as other trails where you can view more petrified wood. A new trail also opened in spring 2014, which leads to a previously difficult to access section of the park. This trail, called the Devil’s Playground, is only accessible with a back country permit (available at the Visitor’s Center), but gives hikers a view of eroded hoodoos. That will certainly be on the list for the next time we visit. And one more important mention. In case you weren’t aware, it is a federal offense, punishable with a $350 fine, to steal petrified wood. Of course, lots of people are stupid, so one of the biggest issues for the park is the theft of tons of petrified wood each year. But that’s where the Curse of the Petrified Forest plays a part. Over the years, thousands of people have returned wood that they have stolen over the years, often with letters explaining that they were befallen with terrible luck after they took advantage of the five finger discount. So many people believe in the curse in fact, that the museum has devoted a whole room to the letters and stories of the unlucky offenders. 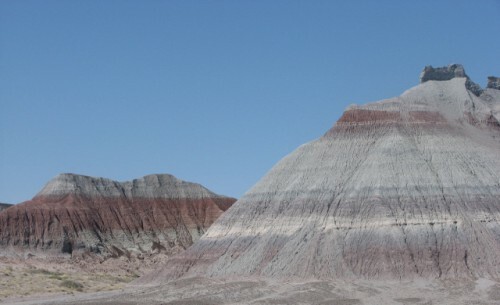 Have you had the chance to hike in Petrified Forest National Park? And do you believe in the Curse of the Petrified Forest? We began our trip through Petrified Forest National Park with a stop at the Visitor’s Center, for postcards and my National Parks stamp! As Visitor’s Centers go, this is a fairly large one, with a cafe and even a gas station! But with this being a stop-through for us, we didn’t have enough time to do any major hiking, so we got the information on the highlights and moved on. 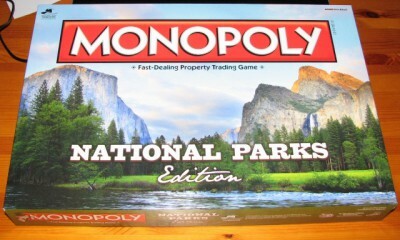 The park is basically a 26 mile north-south strip of land, with a road running north-south through the middle of it. About half of the park lies north of Interstate 40, and half lies south. Holbrook is the only town of any size nearby and it is located at the southern end of the park. We drove north first, into the Painted Desert. 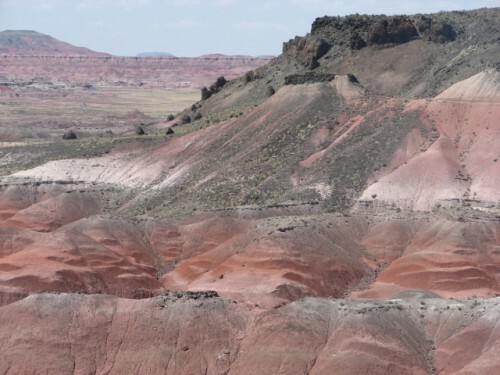 As I discussed in my last post, the Painted Desert is a badlands desert consisting of layers of siltstone, mudstone, and shale, topped with layers of limestone and volcanic ash. Due to the fact that these layers erode at different rates, the landscape has become a series of colorful mesas rising above a valley floor. It is considered a cold desert, warm in the summers and cold in the winters, but it receives hardly any snow – less than 3 inches per year. Along our way we stopped by to see the Painted Desert Inn. This Inn was built between 1937 and 1940 using Civilian Conservation Corps (CCC) labor. The Inn prided itself on offering excellent hospitality to travelers stopping at this remote location along Route 66. The Inn also served meals in an onsite diner and had an ice cream and soda fountain counter. From 1947 to 1963, the Inn and the diner were operated by the Fred Harvey Company and staffed with Harvey Girls. The Fred Harvey Company revolutionized the concept of travel dining and is credited with establishing the first chain restaurant. When trains began shuttling people west in the mid 1800s, the only option for meals during the journey was at roadhouses at stops along the tracks. The food was subpar. Fred Harvey began building inns and restaurants at key stops along the rail line, and created a system to quickly feed all of the passengers on the train a quick yet quality meal. He eventually transitioned to hiring only young, single, white female servers and established strict expectations for them. To be a Harvey Girl meant adhering to a high standard of manners and civility, remaining single, wearing a very conservative serving uniform, and having a curfew of 10 pm. In exchange, they received a generous wage for the time, and room and board. 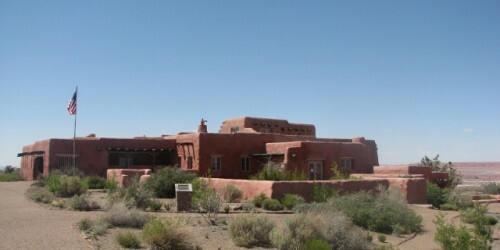 The Painted Desert Inn closed in 1963, and was slated for demolition until there was a public outcry by citizens. It was placed on the National Register of Historic Places and designated a National Historic Landmark in 1987. Now the soda fountain and diner have been restored, and you can see what it would have looked like when it was operating as an inn. The Inn also contains a small museum with exhibits on its history, and historic photographs and postcards. It was a brief stop, but well worth the time. 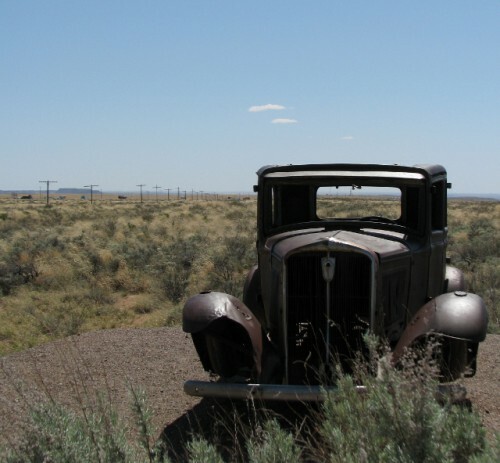 As I mentioned, Petrified Forest National Park is located along historic Route 66, the famed route that lead people from Chicago to Los Angeles. The park has a scenic viewpoint dedicated to Route 66, where you can see where the road once was. It is marked by the old telephone poles that once lined the stretch of road, adjacent to the current Interstate 40. It was interesting to think about some of my relatives traveling on this same stretch long before I was alive. This car didn’t make it to California! The telephone poles in the background mark the old Route 66. We also stopped to see The Tepees area, which contain mesas with thick deposits of grey, blue, purple, and green mudstones and minor sandstone beds. The layering and color differences are very prominent here, and we enjoyed checking out the different mesas and comparing them. The Tepees area of the park is part of the Blue Mesa Member, which is one of the oldest layers in the Chinle Formation; it is 220-225 million years old. Wow. In case you didn’t know, like me, Member means layer. The Tepees area; part of the Blue Mesa Member. In my next post, I’ll tell you about our visit to the southern section of the park, which contains more petrified wood! 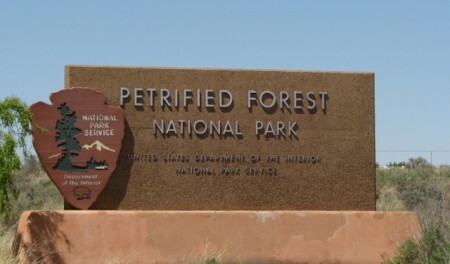 Have you been to Petrified Forest National Park? What was your favorite part? Petrified Forest National Park is located right along Interstate 40, so we were going to drive straight through it on our way from Albuquerque to the Grand Canyon. So, of course, it was next on our list! Petrified Forest National Park contains 221,552 acres (146 square miles) of land, which is divided into two main areas, the Petrified Forest which gives the park its name, and the Painted Desert. Each area is very different. The petrified logs were created in the late Triassic period, about 225 million years ago. At this point in history the area was sub-tropical, warm and humid. Trees fell into streams and sometimes were quickly covered with sediment. This allowed the organic material to remain intact, and over time minerals leached into the wood and replaced the organic material. The wood becomes stone. The area within the park is known as the Chinle Formation, which is present throughout much of the Southwest, and contains many different types of sedimentary rock in different colors. The Colorado Plateau on which the area sits began to be pushed upward about 60 million years ago, exposing the Chinle Formation to erosion. The different layers erode at different rates and form a gorgeous landscape of different colors and types of sediments, with raised hills dotting the valley. 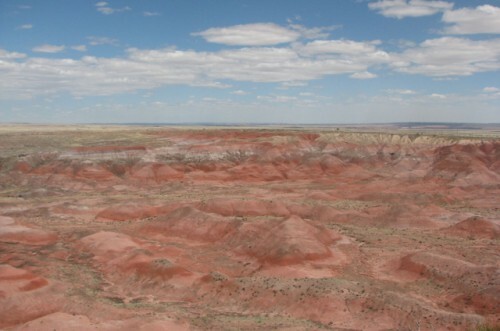 The Painted Desert section of the park shows the layers very well, which create the amazing colors. The park contains a number of fossils, in addition to the fossilized wood. Fossils found in the park have included Late Triassic ferns, cycads (which are a type of tropical tree), ginkgo trees, giant reptiles called phytosaurs (a large reptile that had many similarities to modern crocodiles), large amphibians, and early dinosaurs. The park has had researchers unearthing fossils since the early 20th century. The area’s earliest human inhabitants arrived about 8,000 years ago, around the same time humans arrived in most of the other areas of the Southwest. Eventually, like other Puebloan people, they began building pit houses and above ground pueblos. The park contains over 600 archaeological sites, including the remnants of pit houses, pueblos and petroglyphs. They abandoned the area around 1400 C.E., like other settlements in the Southwest, probably because of a prolonged drought. Spanish explorers visited in the 16th century, and American survey teams went through the area in the 19th century looking for a route to the West. Additional travel through the area and the railroad increased visitation, and sadly, more visitors resulted in the theft of a significant amount of petrified wood. 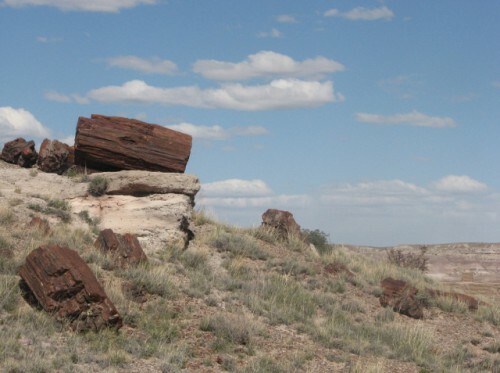 To protect the area, Petrified Forest was named a National Monument in 1906 by President Theodore Roosevelt, and the designation was changed to a National Park in 1962. Annual visitation is now approximately 600,000 annually. In my next post, I will tell you about my visit! 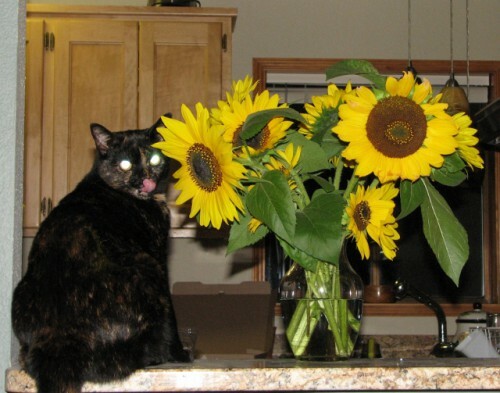 I got these beautiful sunflowers from a friend’s garden for my birthday. But Coraline couldn’t keep her tongue off of them! Coraline – Caught in the Act!